U.S. Open apparel scripts are just starting to be released, but Webb Simpson’s script from IZOD is one of the best I’ve seen so far. Each of the looks give off an air of preppiness that fits him well and the clean sweep of red, white and blue outfits across all tournament days leave little doubt that he is an American playing in his national championship (not to mention the defending champ). Simpson will make a stylish start out of the gate on Thursday with a rugby-striped polo–one of the hottest trends in golf apparel this summer. Another big trend this year is colored belts and IZOD will outfit Simpson with red belts on three of the four days. The white belt in the third round is a great addition. It breaks up the red shirt and black pants nicely and adds a bit of pop to the look. A unique aspect of the U.S. Open is the 18 hole Monday playoff. What will players wear if they find themselves in a playoff and have only been scripted for four rounds? Apparel anarchy? 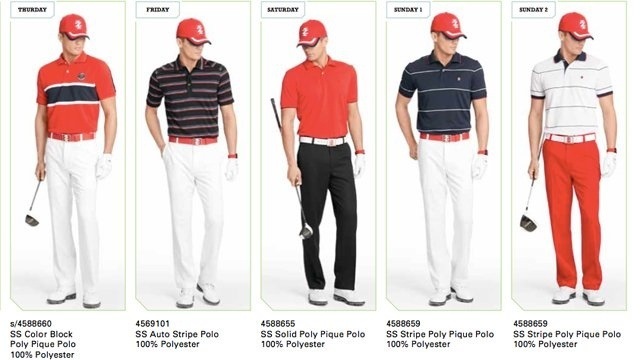 Well, IZOD is the only brand that has planned for the extra 18 holes in their script with a fifth outfit. Here are links to Webb Simpson’s various looks. Hopefully someone with the U.S. Ryder Cup team is taking note of Webb Simpson at Merion. This is how you do red, white and blue.